Consumer electronics companies worldwide felt sure that the public would be interested in a machine that would tape their favorite television programs in their absence for replay at home at their leisure. But in 1971, there were no such products on the market for consumers, and there was still some debate over what exactly people wanted. Two companies determined to solve both problems were Sony Corp. of Tokyo and The Victor Co. of Japan, known as JVC Ltd. Yokohama. Obviously, that product had to include the convenient cassette. In 1962, the cassette had won over the mass market to audio tape recording, which until then had interested only audiophiles. But “the video problem was 10 times as complex as the audio problem,” explained Joseph Roizen, a former Ampex Corp. engineer who is now a consultant for the television and video industries. Video signals range up to 4.2 megahertz and contain far more information than audio signals, with their 20-kilohertz maximum. 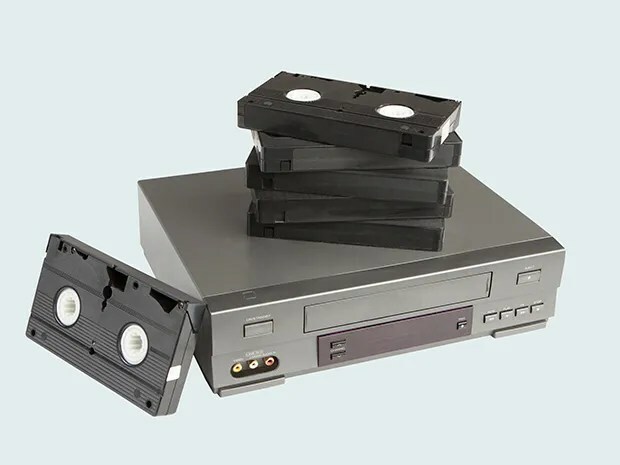 An audio tape is simply pulled past an immobile recording head; but most videocassette recordings use helical scanning, with the tracks running at a diagonal across the tape and with the tape typically spiraled around a rotating drum with two or more recording heads on it. Therefore, unlike audio tape, which is left in the cassette and simply moved past the recording head, videotape must be literally pulled out of the cassette and wrapped around the drum, without ever slipping out of position. The InstaVideo (also called InstaVision) project died soon after it was brought to market. One of its problems was the cartridge, which was less reliable than a cassette and sometimes frustrated users. The group also could not get the cost down to a reasonable consumer price. Another problem, explained Roizen, was that Ampex had earned its reputation in the professional video realm, so that the sales force never seriously marketed the InstaVideo product, nor did distributors and retailers perceive it as a supplier of consumer video products. Sony meanwhile had developed the U-format or “U-matic,” a cassette-based recorder—in collaboration with JVC and Matsushita Electric Industrial Co., Osaka, and with licenses from Ampex—and had introduced it as a standard for VCRs in 1971. But the $2000 recorders and the $30 cassettes (in 1988 dollars about $6000 and $90) were big and heavy. The VCR unit measured 24.25 by 8.125 by 18.125 inches (61.6 by 20.6 by 46.4 centimeters) and weighed in at 59.5 pounds (27 kilograms). Consumers were again unimpressed, and the companies quickly retargeted the product to the educational and industrial training markets, where the U-format proved popular. But as consumer product companies, neither Sony nor JVC was satisfied with the limited educational and industrial markets. They knew that to appeal to consumers they had to develop a VCR that was both smaller and cheaper than the U-format. The companies hoped to work together to establish a standard for helical-scanning videocassette recorders using tape that was half an inch (12.5 millimeters) wide, which, said Roizen, “they were gong to flood the world with.” They easily agreed that the tape width should be reduced to a half inch, rather than the three-fourths of an inch. specified in the U-matic design. Then the trouble started. Masaru Ibuka, the founder of Sony, who in the early 1950s had decreed that his engineers were to design a transistor radio the size of a man’s shirt pocket, came into the Sony offices one day, tossed the company’s employee handbook onto a table, and told his employees that the target for their VCR project was to be a videocassettes smaller than that handbook. The size of a standard American paperback (150 by 100 by 15 mm), it was to hold at least one hour of color video, he said. Meanwhile, the then general manager of JVC’s Video Products Division, Shizuo Takano, decided that it was time for JVC to come up with a worldwide standard for home video. 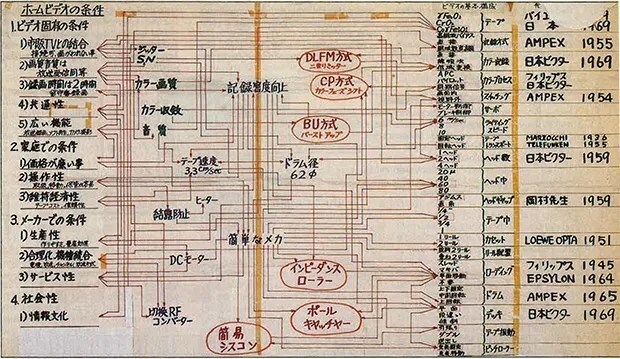 To get things going, the general manager of JVC’s Research and Development Division, Yuma Shirashi, drew up a matrix of requirements that was not quite as simple as the size of a paperback. One key requirement of the system was a “more-than-two-hour recording capacity” because he noticed that movies and sporting events typically lasted two hours. JVC’s engineers used this matrix as a guide to the development of its videocassette recorder. The design goals are listed on the left; applicable technologies and patent information are on the right. The circled notations in the center of the matrix indicate those technologies that had to be developed to achieve the design goals. Sony showed a prototype of its proposed Betamax format VCR to Matsushita and a few other Japanese companies in 1974. According to Japanese trade paper, the chairmen of Sony and Matsushita met in secret late at night on the subway, with the Matsushita side arguing that it had found a way to get two hours of playing time on a cassette only a third bigger than a paperback book, with the Sony side unyielding on size and unwilling to go to a lower playing speed, which would make high picture quality harder to achieve. Both Sony and JVC claim that their original VCR models had offered 240 lines of horizontal resolution and a signal-to-noise ratio of about 45 decibels. Frank Barr, who tests video products for Advanced Product Evaluation Laboratories in Bethel, Conn., said that at the top of the line, the early Betamax models by Sony had a slightly better resolution and signal-to-noise ratio than JVC’s early VHS models. One reason for this slight difference lies in the selection of carrier frequencies‑the VHS carrier signals fall between 3.4 and 4.4 megahertz, the Betamax signals between 4.4 and 5.g MHz, the greater bandwidth allowing higher resolution. Though this difference was almost indiscernible, it led videophiles to recommend Betamax as the ultimate format, Barr said. The companies would not compromise their primary design goals—paperback size versus two hours playing time—so they decided to go their separate ways. In addition to tape width, the companies were agreed on the use of helical-scanning technology. In audio tape recoding, the recording head stays put and lays a longitudinal track on the moving tape. In early professional video recording, four heads on a rotating drum laid tracks directly across the width of the tape. With the quad format, as it was called, information could be more densely packed then with the longitudinal format; also, because the tracks were so short, problems with tape stretching were reduced. On the other hand, one track could not hold all the picture information in a frame, which was therefore separated into 16 tracks, with each track read by one of the four heads on the drum. Differences in head quality and alignment led to banding on the screen or “venetian blind” effects. Helical scanning, which warps the tape around the drum at an angle, like a candy cane’s stripes, has the advantage of quad recording—reducing problems caused by tape stretching—but not its drawback—each slanted stripe can carry a full frame. Going to a ½-inch tape in a reasonably small cartridge required a number of technological advances that, working together, reduced tape consumption from approximately 8 square meters per hour for the U-format to approximately 2 m2/h for the VHS and Betamax units (the writing speed of VHS is slightly lower than that for Betamax: 5.80 meters per second versus 7.00 m/s). For one thing, advances in IC technology made by Sony and other companies allowed VCRs to produce a better picture with less noise (the signal-to-noise ratio in the U-matic was 40 dB as against the 45dB claimed for the first Betamax and VHS recorders). Moreover, improvements in video heads reduced their gap size by about a factor of 10, to 0.3 micrometer, allowing the tracks they wrote and read to be smaller and thereby increasing recording density. Also, advances in magnetic tape (specifically, the use of a cobalt alloy for the magnetic coating) increased its sensitivity and made it possible to pick up very short wavelengths. Besides the industrywide advances in IC, head, and tape technology, Sony and JVC found means, albeit slightly different, of adapting to their products another recording technique that increased information density. A technique called azimuth recording had been used in black and white videotape recording since the late 1960s. In azimuth recording, the video heads are mounted at angles—tilting one to the left and one to the right—from the perpendicular to the run of the tape. Because the tracks recorded by these heads are not parallel to each other, the heads are less likely to pick up the wrong signal. Sony tried to apply this technique to color video recording in the U-matic, but it did not work. The color signals, which use lower frequencies than black and white signals, interfered with each other, and Sony had to leave blank spaces of tape as guard bands between the video tracks. A researcher at Sony, Nobutoshi Kihara, continued to work on this problem even after the U-matic went into production. He developed a phase-inversion system, recording the color signals on adjacent tracks 180 degrees out of phase with each other, to eliminate interference between the signals. JVC meanwhile came up with its own solution—a phase-shift system, recording each color signal 90 degrees out of phase with adjacent tracks. Both solutions let the companies eliminate the tape-wasting guard bands, and both were patented, Sony’s in 1977 and JVC’s in 1979. While Sony was content to duplicate in its Betamax the U-loading mechanism developed for the U-matic, JVC instead used a system it called M-loading. 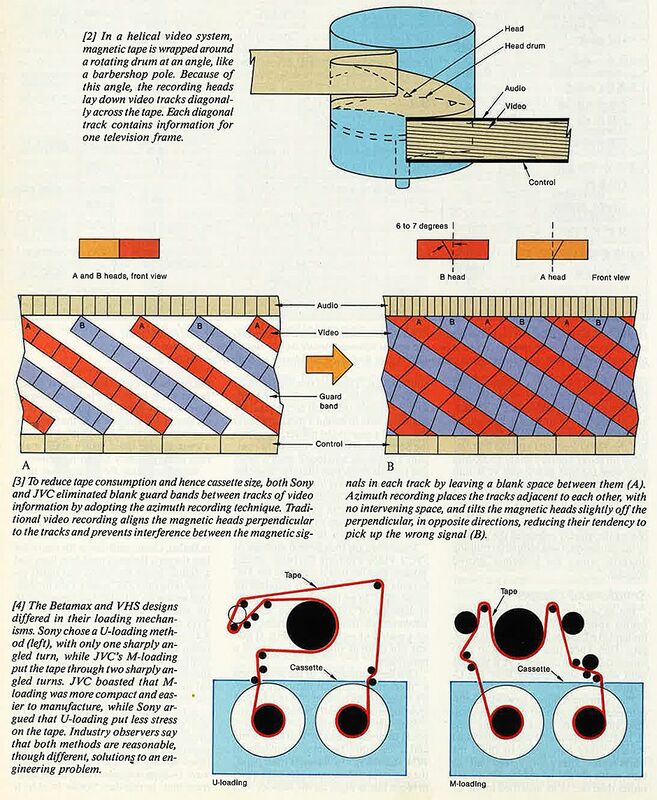 JVC says that M-loading made the machine easier to manufacture, more compact, and more reliable, because the tape guide poles did not contain moving parts. Sony argued that M-loading was not superior and that U-loading only looked more complicated, whereas in reality it was a simple mechanical apparatus and indeed better than M-loading because it reduced stress on the tape (an M-loaded tape wound around two sharp turns, a U-loaded tape wrapped around one pole only). Others say that both U- and M-loading solved the same design problem, and neither had a major advantage. With U-loading, a single arm reaches into the cassette, pulls out the tape, and wraps it around the head. With M-loading, two arms, on either side of the recording head, grab the tape and pull it against the head, the arms traveling a much shorter path than the U-loading arm. To record for a longer time than Sony, JVC used a cassette tape 30 percent larger in volume and, as already noted, a lower writing speed (5.8 m/s versus Sony’s 7.—m/s). Other things being equal, reducing the writing speed reduces the signal-to-noise ratio. JVC said it overcame this disadvantage by giving the signal a greater pre-emphasis boost, increasing the magnitude of some frequency components more than others to reduce noise. Increasing the signal in this manner, however, leads to bleeding in white areas of the picture. Accordingly, in the JVC design the signal is also first sent through a high-pass filter to eliminate low frequencies, next has its high frequencies amplified and then clipped to stop the bleeding, and finally has the high frequencies recombined with the low frequencies and clipped again. Sony offered the Betamax to Matsushita and other Japanese companies as a standard. Toshiba Corp. and Sanyo Electric Co. eventually took them up on this offer. JVC persuaded several other Japanese firms to join it in producing VHS machines. In the United Sates, Zenith Corp. initially joined the Betamax group, while RCA Crop. Went with VHS. Those consumers that marketers call “early adapters”—the technically literate videophiles with money to burn—quickly committed themselves to Sony’s Betamax because of reports that its resolution and signal-to-noise ratio were better. But since few of them—and hardly any consumers in the mass market—could tell a difference in quality between the two formats, the convenience of longer playing time won out, and today the VHS format is clearly the consumers’ choice, particularly in the United States. The first models were introduced in 1975 and 1976—Sony’s Betamax SL6300 at 229,800 en ($820 at 1975 rates) before JVC’s HR3300 at 256,000 ($915). Then the two formats began converging. Sony responded to JVC’s built-in clock (for unattended recording) with a plug-in timer module for its original units and with built-in timers in its later models. Sony also introduced Beta II, with two hours of playing time, and JVC responded with JVC long-play, a six-hour format. This entry was posted in Video and tagged IEEE Spectrum. Bookmark the permalink.